Yesterday Sergio went down to theatre for another EGD and a dilation. The surgeon afterwards reported that his esophagus was looking good and that he was also encouraged to see his Nissen Fundo intact. With each passing day, Sergio is regaining back his physical strength and this is very noticeable as he’s moving around a lot more now in his bed. This obviously brings back the old problem of getting himself all tangled up with the many wires and tubes. 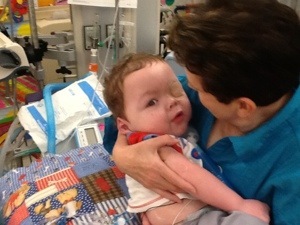 The other piece of news is that he has to wear an eye patch for 2 hours daily to help rectify his lazy left eye. Thankfully though it doesn’t bother him too much to wear it. Ayer a Sergio le llevaron abajo para otra EGD y una dilatación. El cirujano después informó que su esófago se ve bien y que se sentía satisfecho también de ver que la ultima operacion que le hicieron esta intacta (Nissen Fundo). Cada día que pasa, Sergio está recuperando de nuevo su fuerza física y esto es muy notable ya que se mueve alrededor mucho más ahora en su cama. Esto, obviamente, trae de vuelta el viejo problema de meterse enredado con los cables y tubos. La otra noticia es que tiene que usar un parche en el ojo durante 2 horas al día para ayudar a rectificar su ojo izquierdo vago. Afortunadamente no le molesta demasiado el tenerlo.